Fleeing violence back home, a father shepherds his family through a 13,100-mile trek into jungles and raging waters, bound for refuge in Maine. At times along the way, Matare regretted his decision to leave southern Africa and lead his family on a dangerous, uncertain journey through Central America and Mexico to reach the United States. He regretted it in a rickety boat with his wife and four kids on the rough sea at dawn off the coast of Colombia. He regretted it while trudging on foot through the muddy jungles of Panama. And again while riding on horseback through Nicaragua, and trying not to get caught up in political violence there. But the 47-year-old said he had no other choice. He had been tortured by Angolan police and knew he needed to leave to keep his family safe. The epic 13,100-mile journey took his family into dangerous areas with drug cartels, militias and human traffickers, through untamed jungles, over mountains and across seas. They endured desolate stretches pockmarked by death, exploitation and suffering. And the occasional miracle. Along the way, Matare heard about a small American city where newcomers are welcomed and given support. Matare and his family are among the growing number of African migrants who are reaching the United States through the southern border with Mexico and asking for asylum from religious and political persecution. 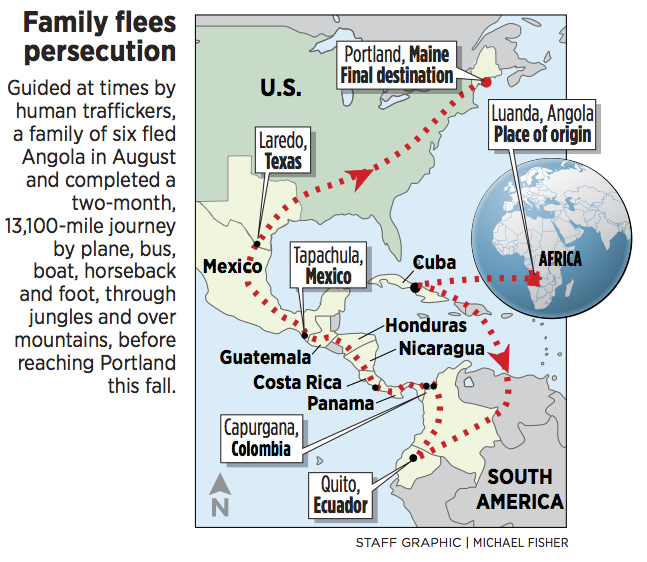 And many of those who make it to the United States are coming to Portland – a final destination that, despite its cold winters, has a good reputation among migrants who sometimes travel together along the way. Matare spoke to a reporter under the condition that his full name would not be published because he has two children still in Angola and he fears that speaking out against the government will put them in danger. 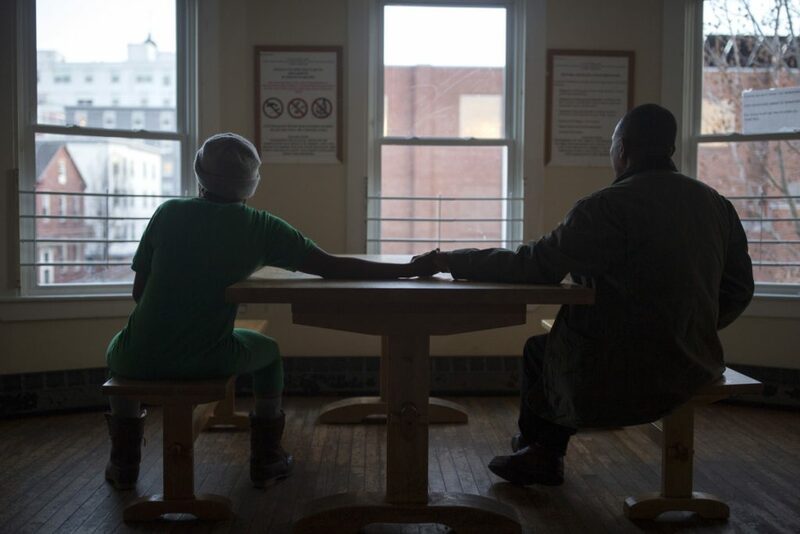 The Portland Press Herald/Maine Sunday Telegram interviewed Matare, who speaks Portuguese, with the help of an interpreter provided by the city of Portland, and reviewed his immigration documents and shelter records to verify aspects of his family’s story and difficult journey. While the national spotlight has focused on a caravan of mostly Central American migrants as it moved north and ultimately reached the U.S.-Mexico border, Matare’s family represents a largely overlooked story about ongoing immigration through the southern U.S. border. 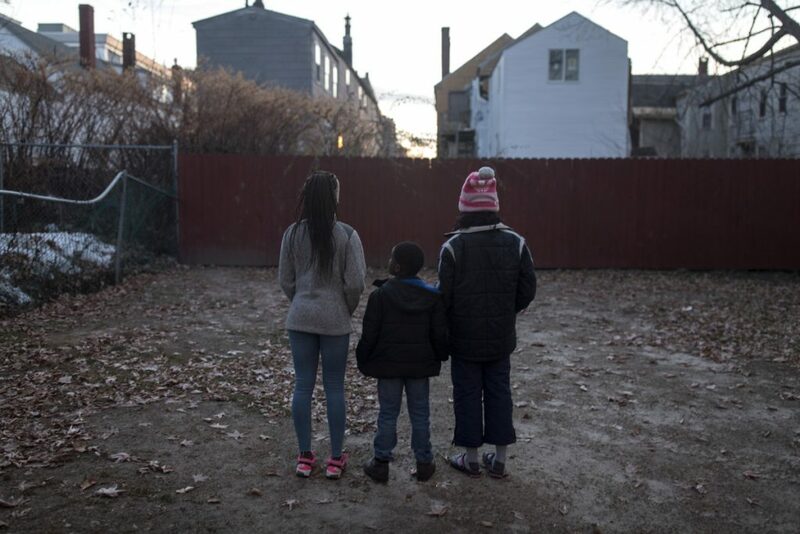 Some immigration advocates say that African families like Matare’s are making that trek in increasing numbers, primarily because they no longer have other choices. The safest way for asylum seekers to come to the U.S. is by securing a temporary visa and applying for asylum when they get here. But advocates say that such temporary visas for tourists or workers are harder to come by under the Trump administration, especially for entire families. Each month, thousands of people arrive in the United States from all around the globe and ask for permission to stay because of violence or persecution in their homelands. Decades of civil war have ended in Angola, but there are still sometimes-violent confrontations between the government and its political opponents, according to Human Rights Watch. Matare said an ongoing conflict between the government and his church led to police opening fire on his Adventist congregation in Huambo. That violence may have been related to clashes in the spring of 2015, when Reuters reported that 13 Seventh-day Adventists and nine Huambo police officers were killed. An anti-government political group told Reuters that hundreds of people had been killed by police in revenge attacks, although those reports were not verified. Matare said he escaped the threat of violence by moving about 275 miles northwest to the Angolan capital of Luanda, which lies on the west coast of southern Africa. He was working as a security guard and driver when he returned home earlier this year and found police waiting for him. He said they tortured him, but he declined to provide details. The incident forced him to flee. Matare said he could only escape with his 45-year-old wife and four children, ages 7 to 21. He had to leave his two other children from previous relationships behind, because he didn’t have time to find them. After his wife and son both tried unsuccessfully to get visas to come to the U.S., he decided to head to South America in an attempt to reach the U.S. through the southern border. Three of Matare’s children, two daughters and a son, stand in the backyard of Portland’s Family Shelter earlier this month. The family’s perilous journey took them through untamed Panamanian jungle, including a climb up a steep mountain called the “Hill of Death.” At times they even paid human traffickers for assistance. His brother secured his family visas to Cuba and they flew to the island nation on Aug. 12, beginning a two-month odyssey along a well-established migrant trail of illegal border crossings and human traffickers, known as coyotes. He originally planned to go to a large U.S. city, such as Washington, D.C., Boston or New York. But after speaking with some Congolese migrants along the way, he would choose a new destination for his family. 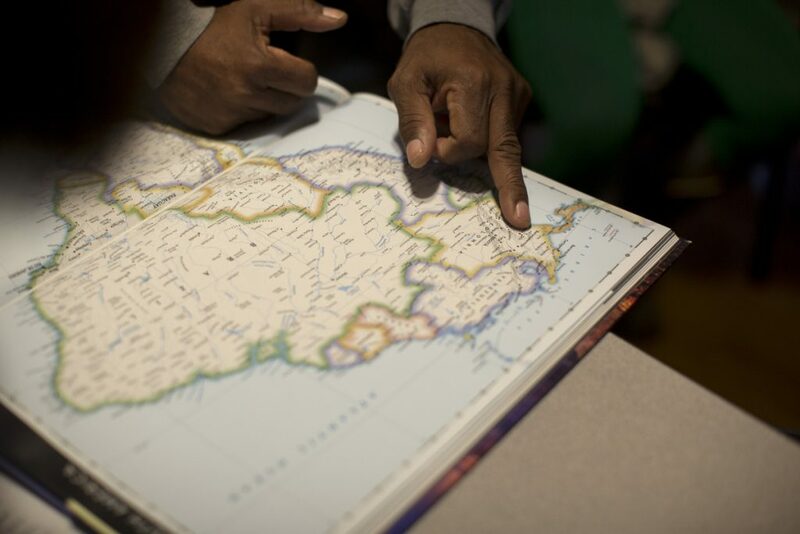 “We heard that Maine was a place where a lot of people have been able to get asylum,” he said. After spending seven days in Cuba, the family flew to Quito, Ecuador, the country’s capital dramatically situated in the Andean foothills. There the family boarded a bus to the Colombian border and then continued to the northern Colombian town of Turbo, a port city located on the coast of the Caribbean Sea. It was the beginning of one of the most dangerous legs of their journey. The only way into the Panamanian jungle was a three-hour voyage aboard a small boat to reach Capurgana. The trip had to be taken at dawn to avoid Colombian authorities, he said. “The waves were rough. The boat itself was not that great. So I was scared as we traveled three hours,” Matare said. From there, they relied on a coyote to lead his family along the rugged, hilly and virtually untamed jungle region known as Darien’s Gap. It was raining when they set out, and the muddy trails included a climb up a steep mountain, known locally as the “Hill of Death.” It is not uncommon for migrants to die or pass dead bodies along the way, according to news reports about the migrant trail. Matare was making the journey through wild lands filled with snakes and scorpions with his wife; two sons, ages 7 and 21; and two daughters, ages 13 and 15. Their only food during the five-day walk was crackers and sardines. What documents they had, including their Cuban visas, were destroyed during the trek. They encountered great suffering along the way, including a pregnant woman trying to make the hike in the rain and through rivers. Matare said he worried often about his own children. But their faith and hope for a better life in the United States gave his family strength to persevere. After leaving the jungle, Matare said his family checked in with Panamanian immigration authorities, who allowed them to continue on their journey. From there, his family took buses through Panama and Costa Rica, sometimes pooling their resources with other migrants along the way. They would occasionally be met with charity and rest in camps with other migrants. Other times, they sought to pass unnoticed. Once they reached the northern border of Costa Rica, the family again put their safety in the hands of a coyote. They believed it was the only way to get through Nicaragua without encountering police or gangs. Matare said they journeyed on horseback for two days through the jungle. There were three people – the trafficker and two others – per horse. This was the most frightening part of the journey for his family, who had no experience with horses and worried about potential violent encounters. Emerging from the jungle, the family found safer passage through Honduras, where Matare said they were greeted warmly by immigration officers and others, who provided charity. They traveled by bus through Honduras and Guatemala and on to the southern Mexico town of Tapachula. In southern Mexico, however, his family was separated for the first time on their journey. Authorities allowed Matare to stay with his 7-year-old son and 13-year-old daughter, while his wife remained behind with their 15-year-old daughter and 21-year-old son. Matare and his two kids would be the first to reach the U.S. border. It’s unclear why they were separated. Matare outlines his path from Africa, through Latin America and into the U.S. In southern Mexico, authorities separated the family – Matare and his wife each with two children. “It was very scary, because I had no idea what was going to happen to her or if I would be able to see her again,” he said. Matare and his two children took a bus to Laredo, Texas, crossing the U.S. border on Oct. 20 and declaring to border agents his intent to seek asylum. He said he was processed and released in about a day. At his request, immigration officials bought him a bus ticket to Portland, Maine, he said. He arrived on Oct. 26 and checked into the city’s Family Shelter on Chestnut Street, which is overflowing with families like Matare’s. His wife’s journey was more difficult. She also took a bus from Tapachula to Laredo. But when she crossed into the United States on Nov. 1, she and her two kids were all detained for four days. Once released, she and her daughter secured a bus ticket to Portland, but her 21-year-old son was held in detention, apparently because of his age. He is now being held in Florida, they said. After much praying, Matare said, he was reunited with his wife and daughter about a week after he arrived at the city’s Family Shelter. With the city’s Family Shelter overflowing with homeless families, most of whom were noncitizens largely from countries such as the Democratic Republic of Congo and Angola, Matare and his family were assigned to an overflow facility and slept on thin mats on the floor, along with dozens of other men, women and children. After a month of sleeping on the floor at the city’s warming center and the Salvation Army gymnasium, they were placed in the actual family shelter, where they have bunk beds and access to a kitchen, bathroom, showers and other resources. Matare’s 7-year-old son initially seems shy around strangers and is hearing-impaired. His older sisters, who have long braided hair, seem a little more outgoing and their faces light up when asked about school. All three children, who are learning English, spend time at the nearby Boys & Girls Club. Matare, an asylum seeker from Angola, and his 7-year-old son, in the backyard of Portland’s Family Shelter. Matare asked that his full name not be published to ensure the safety of two of his children living in Angola. But the family has not yet been able to find a lawyer to help with their asylum claims. The demand for pro bono attorneys to work on asylum cases exceeds the community’s legal resources, according to advocates. They continue to pray that things will work out. “I’m just praying someone will be able to find a lawyer to help me through this process and legalize myself and my family,” he said. But most important, they pray for their 21-year-old son still in detention. He has never been incarcerated before and they have not been able to communicate with him. They pray he is OK and that he will someday be able to rejoin his family in Maine. “I’m glad we were able to get a lot of help over here,” he said. “We have a place to stay and food and all of that.